Happy Anniversary – Celebrating 30 years of the Regulator! Dubai, UAE, October 20, 2018: 2018 is a very special year for Chronoswiss. In addition to the 35th anniversary of the brand´s founding, the 30th birthday of the flagship Regulator model is also coming up. 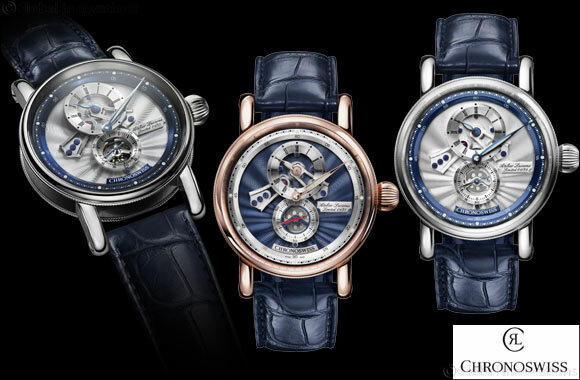 The Regulator made its debut in 1988 as the ‘Régulateur' and has since been identified with the brand, leaving its mark in the watch industry. Whether square or round, Chronograph or Tourbillon, automatic or manual winding – one or more models with the decentralized time display have always been in the collection – Regulator rules! A completely independent collection, lead by Oliver Ebstein, has been developed around this iconic Regulator model and it continues to grow. This means that, figuratively speaking, the model now embodies precisely the key role that it played on the walls of the watchmakers of the late 19th century, where it set the time and was the reference point for accurate timekeeping. The Regulator has set the pace and become the touchstone for the entire collection and brand. Chronoswiss is celebrating its 35-year history with the limited Flying Regulator Open Gear Anniversary Edition – hence the red 35 on the minute scale – and simultaneously honoring its bestselling model. The anniversary watch's unusual design is a play on the Regulator theme, placing it front and center with the “Open Gear” design. The dial is simultaneously its module board, onto which the train wheel bridges of the skeletonized gears are mounted. The train wheel bridges have also been elaborately skeletonized and boast carefully angled and polished edges. Six visually appealing blued screws keep them reliably in their place on the dial, showcasing once again the brand's principle of functional design. The Flying Regulator Open Gear also reveals surprising insights at 6 o'clock. The dial and the bridge have been skeletonized at the height of the small second so that you can see the second wheel in action. Manufactured in a limited edition of just 35 watches, the Anniversary Edition features stainless steel cases with silver-colored dials and blue outer rings. Another 35 timepieces are available in solid 18-karat red gold with a blue dial and silver outer ring. All dials for the anniversary watch are painstakingly guillochéd by hand in the House of Chronoswiss studios in Lucerne using a historical rose engine machine. The individual limited edition number is also applied by hand. Super-LumiNova inlays on the hands and indexes also always ensure optimum legibility in the dark.